Now these ordinances were given … that they might look forward to [Christ] for a remission of their sins, that they might enter into the rest of the Lord. 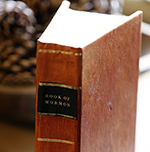 References to ordinances, as well as meaningful examples of them, can be found in numerous Book of Mormon passages. These passages help demonstrate how essential ordinances are to Christ’s Gospel and Heavenly Father’s Plan of Salvation. Webster’s 1828 dictionary, published just before the Book of Mormon was translated, defines an ordinance as “a law” or a “rule established by authority.” For example, in American law, a resolution passed by a city council is often called an “ordinance.” The word “ordinance” or “ordinances” appears 11 times in the Book of Mormon, and these verses show that an ordinance is indeed something firmly established by God, like a law. It is related to the word “order” and suggests the idea of making things orderly, like how laws make society “orderly.” The word can also be used to refer to actions, ceremonies, or religious rituals that solemnize vows or agreements. Pahoran, for example, “was appointed chief judge and governor over the people, with an oath and sacred ordinance to judge righteously” (Alma 50:39). In this case it seems that “ordinance” refers to a sacred law, laid down by God, which stated that Pahoran had to judge righteously, a law that Pahoran likely covenanted to obey. Sometimes, the Book of Mormon uses the phrase “a law of performances and ordinances” to talk about the Law of Moses. This phrase describes the sort of “outward performances” (Alma 25:15) that would eventually become unnecessary because of the Atonement (4 Nephi 1:12). These examples show that the word “ordinance” can be understood as a law “ordered” or decreed by God, laws that people covenant to obey. Because the Book of Mormon was originally written in a language related to Hebrew, a careful look at two possible Hebrew words translated as “ordinance” can help to make sense of the concept. The Hebrew words huqqah and ḥoq have basically the same meanings: “custom, manner, decree, portion, order, prescription, or limit,” and are often translated as “statute” or “ordinance.” The words seem to be similarly used in the Book of Mormon. King David told Solomon to keep God’s “statutes [ḥuqqot], and his commandments [mitzvot], and his judgments [mishpatim], and his testimonies [edot], as it is written in the law [torah] of Moses” (1 Kings 2:3). Similarly, in the Book of Mormon after Jesus came to give the higher law it says: “And they did not walk any more after the performances and ordinances of the law of Moses; but they did walk after the commandments which they had received from their Lord” (4 Nephi 1:12, emphasis added). This example suggests that, when the word ordinance is used in the Book of Mormon, it is talking about more than priesthood rituals. It is referring, in addition, to a wide range of rules that pertain to the making and keeping of the laws of God by way of covenant. Throughout the Book of Mormon, the Nephites performed many of the priesthood ordinances present in the church today. For example, they performed baptisms (Mosiah 18:10), gave the gift of the Holy Ghost (3 Nephi 18:37), administered the sacrament (Moroni 4–5), and ordained men to priesthood offices (Alma 6:1). It is even likely that something like the endowment was performed among the Nephites (2 Nephi 32:4). Although these rituals are rarely referred to as “ordinances” in the Book of Mormon, the Book of Mormon still teaches that ordinances are indispensable to God’s plan. Priesthood ordinances are performed to bind people to God’s laws or to each other as a covenant community. The Book of Mormon’s uses of the word “ordinance” can help to explain the importance of ordinances today. Ordinances are sacred acts performed by the authority of the priesthood. According to the Book of Mormon, God has firmly decreed that these ordinances should be performed, and so it would make sense that they would need to be performed in the prescribed manner, by God’s authorized representatives who hold the priesthood. The Book of Mormon shows that God’s laws are connected with ordinances and that ordinances are performed according to laws established by God. As such, they need to be performed in the exact manner decreed by God. This is likely because they are designed by God to teach spiritual truths, often through symbolism. Therefore, in order for them to teach what God wants them to teach, they need to be done in precisely the way He has spelled out. Certain ordinances are essential to exaltation, and today these are called saving ordinances. The Book of Mormon’s depiction of ordinances as immutable laws from God reminds the reader of the essential nature of these ordinances. They are not simply optional rituals a person can perform if they wish. They are an essential part of God’s divine order. Without receiving these saving ordinances as instructed, and without accepting the laws of order and organization connected with those ordinances, no one can become like Heavenly Father or return to live in His presence. Elder Peter F. Meurs, “The Sacrament Can Help Us Become Holy,” Ensign, November 2016, 85–87, online at lds.org. Elder Dennis B. Neuenschwander, “Ordinances and Covenants,” Ensign, October 2000, online at lds.org. Elder Dallin H. Oaks, “The Aaronic Priesthood and the Sacrament,” Ensign, January 1999, online at lds.org. Noah Webster, American Dictionary of the English Language (1828), s.v., “ordinance.” Online at webstersdictionary1828.com. Eldin Ricks’s Thorough Concordance of the LDS Standard Works (Provo, UT: FARMS, 1995), 553–554. See “ordinance,” at Wiktionary: The Free Online Dictionary, online at Wiktionary.org. The Dead Sea Scrolls contain this usage as well. See Hugh Nibley, Teachings of the Book of Mormon, 4 vols. (Provo, UT: FARMS, 1993), 1:151. 2 Kings 23:3 is one good example of someone covenanting to keep a law, showing the connection between ordinances and covenants. See 2 Nephi 25:30; Mosiah 13:30; Alma 30:23; 4 Nephi 1:12. John W. Welch, “The Temple in the Book of Mormon: The Temples at the Cities of Nephi, Zarahemla, and Bountiful,” in Temples of the Ancient World: Ritual and Symbolism, ed. Donald W. Parry (Salt Lake City and Provo, UT: Deseret Book and FARMS, 1994), 305–306. Alma 30:3 and 3 Nephi 24:7, 14 directly or indirectly connect the word “ordinance” to “law” as well. See John W. Welch and J. Gregory Welch, Charting the Book of Mormon: Visual Aids for Personal Study and Teaching (Provo, UT: FARMS, 1999), chart 119. Because these Hebrew words are basically the same, they don’t appear next to each other in lists. The same is true of the words “ordinance” and “statute” in the Book of Mormon. This suggests that these words are probably very close to the words translated as “ordinance” and “statute” in the Book of Mormon. See John W. Welch, “Statutes, Judgements, Ordinances, and Commandments,” in Reexploring the Book of Mormon: A Decade of New Research, ed. John W. Welch (Salt Lake City and Provo, UT: Deseret Book and FARMS, 1992), 64–65. Welch, “Statutes, Judgements, Ordinances, and Commandments,” 64. Welch, “Statutes, Judgements, Ordinances, and Commandments,” 63. For more on these ordinances, see Book of Mormon Central, “What Is The Purpose of Baptism in the Book of Mormon? (2 Nephi 31:6–7),” KnoWhy 59 (March 22, 2016); Book of Mormon Central, “Why Did Moroni Keep Writing? (Moroni 2:3),” KnoWhy 249 (December 9, 2016); Book of Mormon Central, “Where Did Moroni Get the Sacramental Prayers from? (Moroni 4:1),” KnoWhy 250 (December 12, 2016). Welch, “The Temple in the Book of Mormon,” 305. Even Christ had to receive all essential ordinances. See Joseph F. McConkie, “The Promise of Eternal Life (2 Nephi 31–33),” in Book of Mormon, Part 1: 1 Nephi to Alma 29, Studies in Scripture, Volume 7, ed. Kent P. Jackson (Salt Lake City, UT: Deseret Book, 1987), 165. See “Ordinances and Covenants,” in Doctrinal Mastery: Core Document (Salt Lake City, UT: The Church of Jesus Christ of Latter-day Saints, 2016), 9–10, online at lds.org. Consider, for example, the rigidly fixed way in which baptism is to be performed. See Larry E. Dahl, “The Doctrine of Christ: 2 Nephi 31–32,” in Second Nephi, The Doctrinal Structure, ed. Monte S. Nyman and Charles D. Tate Jr., The Book of Mormon Symposium Series, Volume 3 (Provo, UT: Religious Studies Center, Brigham Young University, 1989), 361. “Ordinances and Covenants,” online at lds.org. Even the exact wording is important. See Brant A. Gardner, Second Witness: Analytical and Contextual Commentary on the Book of Mormon, 6 vols. (Salt Lake City, UT: Greg Kofford Books, 2007), 6:336. Joseph Fielding McConkie, Robert L. Millet, and Brent L. Top, Doctrinal Commentary on the Book of Mormon, 4 vols. (Salt Lake City, UT: Deseret Book, 1987–1992), 4:319. “Ordinances and Covenants,” online at lds.org. See also Noel Reynolds, “Understanding Christian Baptism through the Book of Mormon,” BYU Studies 51, no. 2 (2012): 5–6.